[146 Pages Report] The aluminum caps & closures market was valued at USD 5.39 Billion in 2017, and is projected to reach USD 6.80 Billion by 2023, at a CAGR of 4.05%. The base year considered for the study is 2017, and the market size is projected from 2018 to 2023. The aluminum caps & closures report aims to study the various segments that are part of the manufacturing process of aluminum caps & closures and the end consumers. Thus, the aluminum caps & closures market is studied on the basis of product type, end-use sector, and region. The other objectives include providing detailed information regarding the main factors influencing the growth of the market (drivers, restraints, opportunities, and industry-specific challenges). It also aims to study the individual growth trends, future prospects, and contribution of various segments to the total market. The study also analyzes opportunities in the market for stakeholders and details of the competitive landscape for the market leaders. The study strategically profiles key players and comprehensively analyzes their core competencies. 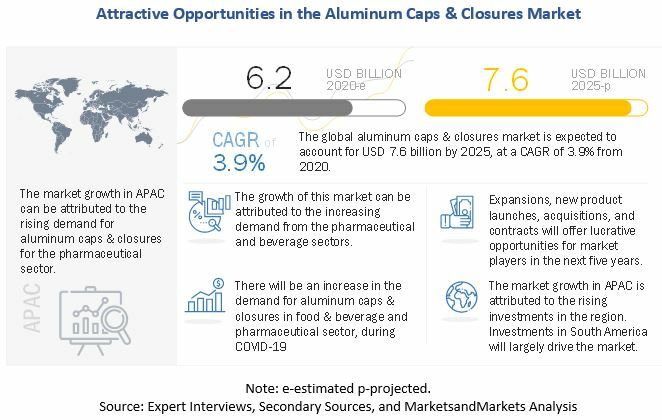 Finally, the study tracks and analyzes competitive developments such as partnerships, agreements, joint ventures, mergers & acquisitions, expansions, new product developments, and research & development activities in the aluminum caps & closures market. The market ecosystem includes various stakeholders involved in the supply chain of the aluminum caps & closures industry, such as raw material suppliers, research & development, manufacturing, and the assembly team. Post this, the marketing and sales of the finished products take place which is only possible if an efficient distribution channel is developed. Finally, the end products are made available to the consumers. 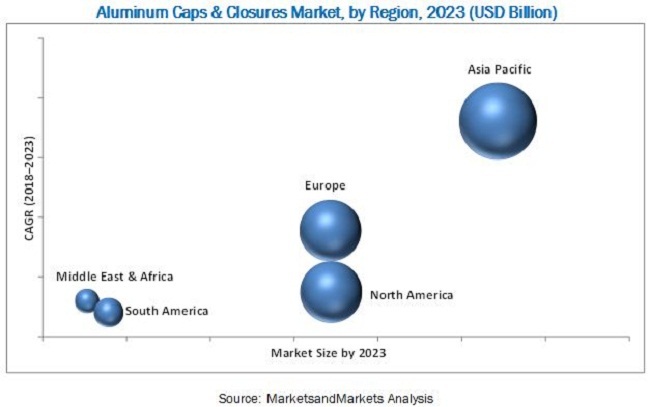 The global market for aluminum caps & closures is dominated by players such as Crown Holding (US), Silgan Holdings (US), Amcor (Australia), Guala Closures (Luxembourg), Closure Systems International (US), Alcopack Group (Germany), Herti JSC (Bulgaria), Torrent Closures (Spain), Cap & Seal Pvt. Ltd (India), and Federfin Tech S.R.L (Italy). MarketsandMarkets projects that the aluminum caps & closures market size will grow from USD 5.58 Billion in 2018 to USD 6.80 Billion by 2023, at an estimated CAGR of 4.05%. The aluminum caps & closures market is expected to witness high growth as a result of the growing end-use industry such as beverage and healthcare as well as the rising concerns toward product quality and safety. Aluminum caps & closures seal the content within the container and allow appropriate dispense of the contents. The segmentation for this report is based on product type, end-use sector, and region. On the basis of product type, roll-on pilfer-proof caps & closures are projected to form the fastest-growing type in the aluminum caps & closures market as they are light in weight, cost-effective, tamper-evident, and can be used to package various types of products belonging to different industries. Aluminum caps & closures are used in various industries and their utility across industries includes maintaining the quality of the products, increasing the shelf life of the commodity, and keeping the products fresh. These are some of the main reasons which have led to the increase in their share in the packaging industry. The beverage segment is projected to have the largest market share and dominate the aluminum caps & closures market from 2018 to 2023. Caps & closures are increasingly used in the pharmaceutical sector, which is expected to play a key role in changing the aluminum caps & closures landscape; the pharmaceutical segment is projected to grow at the highest rate during the forecast period. The beverages industry, for a long time, has been the major contributor to the rising demand for aluminum caps & closures; however, in recent times, this has been closely competed by other industries such as healthcare. Asia Pacific is projected to grow at the largest market share and dominate the aluminum caps & closures market from 2018 to 2023. Asia Pacific offers potential growth opportunities, as developing countries such as China and India are projected to be emerging markets, making the Asia Pacific region the fastest-growing market for aluminum caps & closures. The growth of the aluminum caps & closures market in this region is propelled by factors such as the growth of the food & beverage, healthcare, and personal care industries. The rise in population and economic development are the other factors driving the growth of this market. Factors such as stringent regulations in the aluminum caps & closures industry and growth in demand for substitutes such as blister packs act as a restraint for the growth of the market. The global market for aluminum caps & closures is dominated by players such as Crown Holding (US), Silgan Holdings (US), Amcor (Australia), Guala Closures (Luxembourg), and Closure Systems International (US). Other players in this market include Alcopack Group (Germany), Herti JSC (Bulgaria), Torrent Closures (Spain), Cap & Seal Pvt. Ltd (India), and Federfin Tech S.R.L (Italy). These players adopted various strategies such as expansions, agreements, acquisitions, and new product developments to expand their presence and increase their share in the aluminum caps & closures market. 11.9 Cap & Seal Pvt. Ltd.